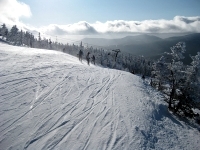 Sugarloaf is one of the best ski mountains in the east, celebrated for its incredible terrain and variety, excellent vertical drop and late ski season which can stretch to May. The resort's relative isolation (four hours drive time from the nearest airport) means quieter slopes even in peak season, while the wide range of activities keeps visitors occupied even if the fairly restricted après ski scene doesn't. The resort is enormous, covering 1,400 acres (560 ha) of skiing terrain, so it's possible to spend a week here and never ski the same run twice. There are 15 lifts in total, including two high speed quads, equating to nearly 22,000 skiers carried per hour. This resort probably has the shortest lift lines of any large US resort, a big plus over holiday season. Sugarloaf is famous for its challenging and super steep black diamond Snowfields, although there are plenty of runs for beginners and intermediates too across the 133 named runs available. The ski school is excellent, though not cheap, and there are plenty of groomed runs on which to practice. The largest town is Farmington, 25 miles (40km) away with a population of around 8,000, so it's no surprise that shopping is not a popular Sugarloaf pastime. The most popular souvenir is thermal underwear to cope with the occasionally icy weather. There are some good quality restaurants right on the slopes of Sugarloaf. Bullwinkle's at the top of Bucksaw Chair is great for lunch, and in the evenings offers a six-course meal at a secluded spot accessed by snow cat. At base lodge one can find Narrow Gauge Food Station, Papa Gino's, and The Whistle Stop Café offering decent enough food on the go. In town don't miss The Bag and Kettle, home to Skiing Magazine's Best Burger 2008/9 and the famous Cheeseburger Soup. Another good bet for great food and après ski entertainment is The Shipyard Brewhaus in the Sugarloaf Inn. Sugarloaf's après ski is a classic bar scene of the beer and sing-along variety, and most venues close relatively early at 1am. Some of the best après ski is at the very top of base lodge in the Widowmaker Lounge, less sinister and a whole lot more fun that it sounds. Weekends are best when live music keeps the party going until late. Check out the Double Diamond Steakhouse and Wine Bar inside the Grand Summit Hotel for live entertainment nightly. Another lively spot is Theo's Sugarloaf Brewery which as has a Margarita Night on Wednesdays. Sugarloaf has a huge range of off-slope activities. There is ice-skating at the Sugarloaf Outdoor Center, cinemas at nearby Farmington, a fitness and spa complex close to the lodge, and even an on-mountain worship center. If you need a break from skiing try tubing, cross-country, snow-shoeing, snowmobiling, and even xtreme sports at the incredible onsite Antigravity Complex. The resort is four hours from the nearest airport. Not the most exciting après ski scene so party animals might be disappointed, as will avid shoppers. Sugarloaf can be a little expensive and gets very cold in February.